The Traveling Wilburys Vol. 1 was nominated for the Grammy Award for Album of the Year in 1989 and helped revitalise the careers of Dylan, Orbison and Petty. It has been certified triple platinum by the Recording Industry Association of America. In early April 1988, George Harrison was in Los Angeles and needed to record a B-side for a European 12-inch single. Jeff Lynne was also in Los Angeles writing and producing some tracks for Roy Orbison on his album Mystery Girl (released posthumously), as well as Tom Petty’s first solo album, Full Moon Fever. While having dinner with Lynne and Orbison, Harrison related how he needed to record a new track and wanted to do it the next day. Harrison asked if Lynne would help, and Orbison offered his old friend his hand as well, seeing how fun it would be. Needing a studio at short notice, Harrison called Bob Dylan, who agreed to let them use his garage studio. After dinner, Harrison stopped by Petty’s house to pick up a guitar he had left there, and invited Petty along too. Gathering at Dylan’s Malibu home the following day, Harrison, Lynne, Orbison and Petty worked on a song that Harrison had started writing for the occasion, "Handle with Care". At first, Dylan's role was that of a host, maintaining a barbecue to feed the musicians; at Harrison's invitation, Dylan then joined them in writing lyrics for the song. The ensemble taped the track on Dylan's Ampex recording equipment, with all five sharing the vocals. Masquerading as the Wilbury brothers, the participants would be known as Nelson (Harrison), Otis (Lynne), Lucky (Dylan), Lefty (Orbison), and Charlie T. Jr. (Petty) Wilbury, with drummer Jim Keltner credited as Buster Sidebury. Harrison was no stranger to the use of alternate identities, as he had adopted them with Sgt. Pepper's Lonely Hearts Club Band and with his plethora of pseudonyms as a session musician, including L'Angelo Misterioso, George O'Hara and Hari Georgeson. During the Beatles' first tour of Scotland, in 1960, he had used the pseudonym "Carl Harrison", in reference to one of his favourite musicians, Carl Perkins. With the Traveling Wilburys, this concept was taken a step further, since the participants' real names do not appear anywhere on the album, liner notes, or the songwriting credits. With Harrison having the greatest claim to the band, he signed them up to Warner Bros. Records, which distributed his solo recordings, and incorporated their own Wilbury Records label, in addition to producing the sessions with Lynne that spring. Petty subsequently signed to Warner Bros. himself as a solo artist, and one of the company's subsidiaries, Reprise Records, released Lynne's solo album Armchair Theatre in 1990. According to statements by Harrison in the documentary The True History of the Traveling Wilburys (filmed in 1988 about the making of the album and re-released on the bonus DVD included in The Traveling Wilburys Collection), the whole band gave various contributions to all songs, although each song was mainly written by a single member; the joint songwriting credit came from the fact that giving individualized credits looked egotistical. We would arrive about twelve or one o'clock and have some coffee. Somebody would say, 'What about this?' and start on a riff. Then we'd all join in, and it'd turn into something. We'd finish around midnight and just sit for a bit while Roy would tell us fabulous stories about Sun Records or hanging out with Elvis. Then we'd come back the next day to work on another one. That's why the songs are so good and fresh—because they haven't been second-guessed and dissected and replaced. It's so tempting to add stuff to a song when you've got unlimited time. Harrison's Umlaut Corporation (formerly Ganga Publishing) is credited for "Handle with Care", "Heading for the Light", "End of the Line" and the bonus track "Maxine", identifying him as the main writer of those songs. In a behind-the-scenes interview included among the bonus features on the 2003 DVD release of the 2002 tribute Concert for George, Petty recalls that the lyrics to "Handle with Care" were the result of a game held by Harrison during a barbecue outside his home studio, with all of the band members (including himself) shouting out lines and Harrison keeping the ones that stuck and writing them in a notebook. According to Petty, the line "Oh, the sweet smell of success" is his. Dylan, credited via his Special Rider Music publisher, wrote "Dirty World" (according to Harrison and Lynne's recollections on the documentary, Dylan and all the other band members gave their input to the song by pitching in funny lines to complete the lyric line "He loves your ..."), the long narrative of "Tweeter and the Monkey Man" (which was apparently intended as either a parody of or tribute to Bruce Springsteen's early, verbose songs), "Congratulations", and the other bonus track "Like a Ship". Petty, published by Gone Gator Music, wrote "Last Night" (again, with substantial lyrical contributions from the entire band) and "Margarita". Lynne's publisher, Shard End Music (named after his birthplace), identifies him as the main writer of "Rattled" and "Not Alone Any More". The separation was not repeated for the publishing credits of Traveling Wilburys Vol. 3, which show all songs as being published by all four publishers. Released on October 18, 1988, Volume One became a surprise commercial success, reaching No. 3 in the US and selling two million copies there within six months. The album also reached No. 16 in the UK. With over 50 weeks on the US charts, The Traveling Wilburys Vol. 1 was later certified triple-platinum by the Recording Industry Association of America. While Harrison and Petty had recent successes, Dylan, Orbison (who died of a sudden heart attack on December 6, 1988) and Lynne had not seen an album climb that high in several years. At the time, no Dylan album had ever achieved two million in sales. As one critic put it, it was "one of the great commercial coups of the decade". The single "Handle with Care" was a significant hit in the UK charts, peaking at No. 21, and an even bigger hit in Australia (No. 3) and New Zealand (No. 4), though it stalled at No. 45 on the US Billboard Hot 100. Most critics said the group's modest ambitions were fresh and relaxing. During 1989 and 1990 the album won many accolades, including a Grammy for Best Rock Performance by a Duo or Group. The album was also nominated for Album of the Year. In his book The Encyclopedia of Popular Music, Colin Larkin describes the Traveling Wilburys as "the last of the great supergroups" and writes of the band's accidental origins: "This wonderful potpourri of stars reintroduced 'having a good time' to their vocabulary and the result was not a Harrison solo album but the superb debut of the Traveling Wilburys. The outing proved to be a major success, bringing out the best of each artist; in particular, this [album] proved to be the marvellous swan song for Roy Orbison who tragically died soon afterwards." After Harrison’s distribution deal with Warner Bros. expired in 1995, ownership of the Dark Horse Records catalog as well as the two Traveling Wilburys albums reverted to Harrison and the albums went out of print. On June 12, 2007, Volume One and Vol. 3 were reissued by Rhino Records as The Traveling Wilburys Collection, packaged together with bonus tracks and a DVD. The box set debuted at No. 1 on the UK Albums Chart and No. 9 on the US Billboard 200. All tracks written by Traveling Wilburys. Otis Wilbury (Jeff Lynne) – lead and harmony vocals, electric and acoustic guitars, bass guitar, keyboards; drums and cowbell on "Handle with Care"
Lucky Wilbury (Bob Dylan) – lead and harmony vocals, acoustic guitar, harmonica on "Handle with Care"
Ian Wallace – tom-toms on "Handle with Care"
^ a b Du Noyer, Paul (April 2004). "Back Catalogue: George Harrison". Blender. pp. 152–53. ^ "Chart Stats – The Traveling Wilburys". Archived from the original on July 30, 2012. Retrieved March 4, 2012. ^ Rolling Stone staff (November 16, 1989). "100 Best Albums of the Eighties, No. 67: The Traveling Wilburys Traveling Wilburys Vol. 1". Rolling Stone. Retrieved April 25, 2016. ^ Greene, Andy (June 14, 2013). "Q&A: Tom Petty on His Rarities Tour, Writing With Bob Dylan". Rolling Stone. Retrieved December 14, 2017. ^ Christgau, Robert. "Traveling Wilburys". Robertchristgau.com. Retrieved December 14, 2017. ^ a b Larkin, Colin, ed. (2011). The Encyclopedia of Popular Music (5th edn). London: Omnibus Press. p. 1994. ISBN 978-0-85712-595-8. ^ "The Traveling Wilburys – Traveling Wilburys, Vol. 1 CD Album". CD Universe/Muze. Retrieved November 1, 2017. ^ Racine, Martin (November 6, 1988). "Records". Houston Chronicle. ^ Harris, John (November 2011). "Beware of Darkness". Mojo. p. 83. ^ Shaar Murray, Charles (December 1988). "The Traveling Wilburys: Good to see the old folks enjoying themselves". Q. p. 139. ^ Wild, David (October 18, 1988). "The Traveling Wilburys Traveling Wilburys Vol. 1 Album Review". Rolling Stone. Retrieved March 4, 2015. ^ Scoppa, Bud (June 6, 2007). "The Traveling Wilburys – Volumes 1 and 3". Uncut. Retrieved March 4, 2015. ^ Leng, Simon (2006). While My Guitar Gently Weeps: The Music of George Harrison. Milwaukee, WI: Hal Leonard. p. 261. ISBN 978-1-4234-0609-9. ^ "The Traveling Wilburys – Limited Edition Book" > "Excerpt showing recording notes for 23 May 1988 overdubs". Genesis Publications. Retrieved November 12, 2017. ^ a b Hurwitz, Matt (November 1, 2007). "Classic Tracks: The Traveling Wilbury's 'Handle With Care'". Mix. Retrieved September 11, 2018. ^ Zollo, Paul (2005). Conversations with Tom Petty. New York, NY: Omnibus Press. p. 120. ISBN 1-84449-815-8. ^ "Past Winners Search". National Academy of Recording Arts and Sciences. Retrieved August 8, 2011. ^ "Here's list of nominees from all 77 categories". Deseret News. Retrieved August 31, 2011. ^ Times Wire Services (January 23, 1990). "Milli Vanilli, Travis and Dancers Star at American Music Awards". Los Angeles Times. Retrieved October 29, 2011. ^ "australian-charts.com Traveling Wilburys – Vol. 1". Australian Recording Industry Association. Archived from the original (ASP) on October 8, 2012. Retrieved October 29, 2011. ^ "austriancharts.at Traveling Wilburys – Vol. 1". Hung Medien (in German). Archived from the original (ASP) on November 7, 2012. Retrieved October 29, 2011. ^ "Traveling Wilburys". Tsort. Retrieved August 24, 2018. ^ "Hits of the World". Billboard. February 25, 1989. p. 68. ^ "dutchcharts.nl Traveling Wilburys – Vol. 1". Hung Medien (in Dutch). MegaCharts. Archived from the original (ASP) on July 16, 2012. Retrieved October 29, 2011. ^ "charts.org.nz Traveling Wilburys – Vol. 1". Hung Medien. Recording Industry Association of New Zealand. Archived from the original (ASP) on November 5, 2012. Retrieved October 29, 2011. 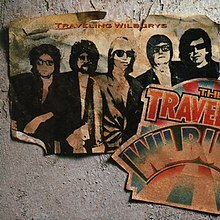 ^ "norwegiancharts.com Traveling Wilburys – Vol. 1". Hung Medien. VG-lista. Archived from the original (ASP) on November 6, 2012. Retrieved October 29, 2011. ^ "swedishcharts.com Traveling Wilburys – Vol. 1" (ASP) (in Swedish). Retrieved October 29, 2011. ^ "Traveling Wilburys – Vol. 1 – hitparade.ch". Hung Medien (in German). Swiss Music Charts. Archived from the original (ASP) on January 15, 2013. Retrieved October 29, 2011. ^ "Traveling Wilburys > Artist > Official Charts". UK Albums Chart. Retrieved September 8, 2013. ^ "allmusic ((( The Traveling Wilburys Vol. 1 > Charts & Awards > Billboard Albums )))". AllMusic. Retrieved October 29, 2011. ^ Ferriter, Gene (chart research co-ord.) (January 28, 1989). "Cash Box Top 200 Albums". Cash Box. p. 17. ^ "Album Search: Traveling Wilburys – Vol. 1" (in German). Media Control. Archived from the original on July 7, 2014. Retrieved October 29, 2011. ^ "Dutch charts jaaroverzichten 1988" (ASP) (in Dutch). Retrieved May 1, 2014. ^ a b "Complete UK Year-End Album Charts". Archived from the original on January 11, 2012. Retrieved April 29, 2014. ^ "ARIA Charts – End of Year Charts – Top 50 Albums 1989". aria.com.au. Australian Recording Industry Association. Archived from the original on June 11, 2011. Retrieved September 13, 2011. ^ "Austriancharts.at – Jahreshitparade 1989" (ASP) (in German). Hung Medien. Retrieved October 29, 2011. ^ "RPM Top 100 Albums of 1989". RPM. Archived from the original on December 31, 2013. Retrieved October 3, 2011. ^ "Hitparade.ch – Schweizer Jahreshitparade 1989" (ASP). Swiss Music Charts (in Swedish). Hung Medien. Retrieved September 13, 2011. ^ "Billboard.BIZ: Top Pop Albums of 1989". Archived from the original on July 21, 2012. Retrieved May 3, 2014. ^ "Canadian album certifications – Traveling Wilburys – Volume 1". Music Canada. ^ "Gold-/Platin-Datenbank (Traveling Wilburys; 'Traveling Wilburys')" (in German). Bundesverband Musikindustrie. ^ "The Official Swiss Charts and Music Community: Awards (Traveling Wilburys; 'Traveling Wilburys')". IFPI Switzerland. Hung Medien. ^ "British album certifications – Traveling Wilburys – Traveling Wilburys". British Phonographic Industry. Select albums in the Format field. Select Platinum in the Certification field. Type Traveling Wilburys in the "Search BPI Awards" field and then press Enter. ^ "American album certifications – Traveling Wilburys – Traveling Wilburys". Recording Industry Association of America. If necessary, click Advanced, then click Format, then select Album, then click SEARCH.